Something of an unexpected release, 2018 Leaf Heroes of the Game Cut Signature appeared in Target retail locations without any formal announcement. Featuring cut signatures from the stars of multiple sports, each sealed blaster box contains one slabbed autograph for $34.99. Every cut signature comes in a brown (or brown and white) card frame that is also encased and labeled with the specifics of the subject. Highlights include Cal Ripken Jr. and Joe Montana. Although baseball and football players appear to be the most plentiful, with many Hall of Fame members, there are also notable basketball, hockey, Olympic and racing (horse and car) names to uncover. 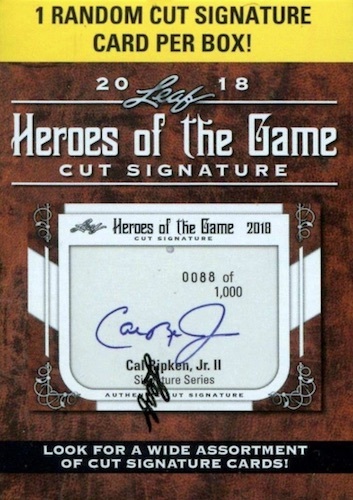 As collectors will notice, a variety of autographed options were used in the 2018 Leaf Heroes of the Game Cut Signature checklist, including signed photos, signed checks and other signed documents. Given the way Leaf normally handles sets like these, it is unlikely that there will be a full list of the possible cards to pull. However, the final checklist will be added here if one is made available. You can also check out available card listings using the link below. 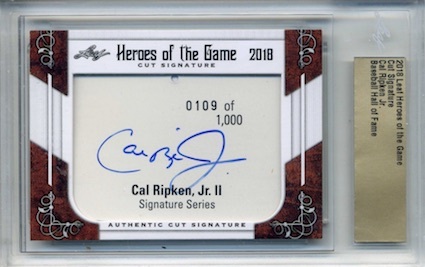 Shop 2018 Heroes of the Game Cut Signature cards on eBay. 2018 Leaf History Happy Chandler cut Auto! These boxes caught my eye on a recent trip to target a few weeks ago, cause I had never seen this product in a retail store! I reached out to CC, so thanks for the above info! 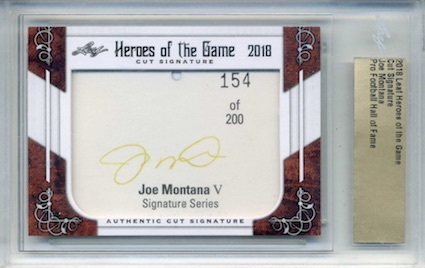 There was only 3 boxes and I bought 1 and pulled a Buck Leonard (the black Lou Gehrig) and after pulling that I was so intrigued of the possible checklist I went back the next day and bought another…there was still the 2 left, I picked them both up,(for what its worth, 1 was noticeably heavier), so I snagged it and it ended up being a Joe Montana 82 of 200…pulling the Montana gets this product a 4 star,they’ll get 5 when they tell us a checklist! Actually really surprised. I bought one and pulled a Lou Boudreau (cut HOF plaque postcard actually cut well), and was so intrigued that I picked up the other two. Wound up with Tony Gwynn and Cal Ripken, these two were cuts from the tags of beanie bears that were made of the athletes (Classic Collecticritters was the brand). Given how crappy my pull was in their last baseball box I picked up a few years ago, I was hesitant to even pick up the first box, but now I’m quite pleased.